Interesting timing. On the same day when Stephen Wolfram shows a demonstration of his knowledge engine Wolfram | Alpha, Google launched a new OneBox that visualizes public data. 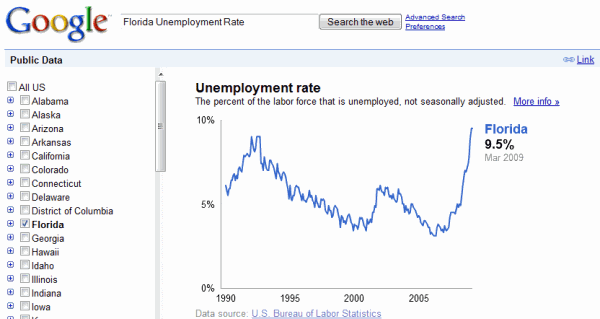 If you search for [Florida Unemployment Rate], Google shows an answer ("9.5% of the labor force - Not seasonally adjusted - Mar 2009"), the source and a graph that illustrates how the unemployment rate changed over time. For now, you can only search for data related to the US: for example, California population. 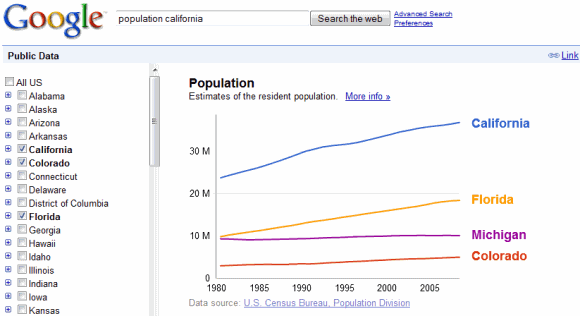 When you click on the result, the graph lets you compare California's population with the population for other states. "Public statistical data, such as unemployment rates or population numbers, doesn't need to be hard to find or, more importantly, hard to understand. Google is making it easier to find and use important public statistical data from governments and other sources. This data is included in Google.com search results and displayed as interactive graphs that you can customize and share with others. If you've ever done research involving large datasets, you know that it can take hours to comb through databases in order to find and analyze trends. Anyone who searches for U.S. unemployment rates or population numbers on Google.com will see relevant statistics and graphs included in their search results. You can even search by state or county (but not by city)," explains the help center. Another good tool for marketers and researchers. I think they are available only for the US users. I tried Canadian city it doesn't work. I just checked this out right now. It's quite fantastic that Google decided to release this data online in graphical forms. And as HTML5 comes onstream and gains acceptance, this would allow the data to be fed from an SQL database and allow the query parameters to be part of the chart request, with the user being able to select time scales and datasets of particular relevance to them. Adding the graphical interpretation of public data just took this to a whole other level. Thanks Google.